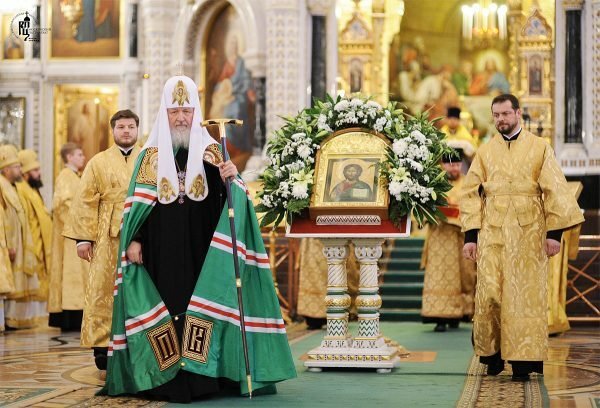 Primates and other high representatives from Local Orthodox Churches around the world will gather in Moscow to celebrate the 10th anniversary of His Holiness Patriarch Kirill of Moscow and All Russia’s election as the Russian primate on February 1. Among the guests will be the primates His Beatitude Patriarch John X of Antioch, His Holiness Patriarch Irinej of Serbia, His Beatitude Metropolitan Rostislav of the Czech Lands and Slovakia, and His Beatitude Metropolitan Tikhon of Washington and All America, and high representatives from the other Local Churches, Archpriest Nikolai Balashov, the Deputy Head of the Moscow Patriarchate’s Department for External Church Relations (DECR), said at a round table in Moscow reports Interfax-Religion. Fr. Nikolai also said that the ongoing Ukrainian Church crisis will be the central theme in Pat. Kirill’s meetings with the visiting primates and hierarchs at that time. “The celebrations will be an occasion to discuss topics that arise not only in Ukraine, but also in the global Orthodox family,” he said, noting that many Synods and hierarchs have expressed “deep concern about the ongoing political invasion” in Church life.